A QUIVER of Silver Arrowhead awards has landed on the Fraser Coast as the Scout Association of Australia thanked those who helped make the 2013 Jamboree a success. Fraser Coast Mayor Gerard O'Connell said it was fantastic to accept the award on behalf of the council and residents. "It was a big effort by a range of staff across council and it was a pleasure working with the scout association," he said. "The facilities and improvements to the showgrounds and equestrian areas will be a lasting legacy of the jamboree and the scouts' visit. "The relationship between council and scouts is very strong and planning is underway for future events to be held on the Fraser Coast such as the Cuboree during the September School holidays next year." Almost 12,000 scouts attended the 10-day jamboree at the Maryborough Showgrounds in January. The award was presented by the chief commissioner of the Scouting Association of Australia Kristy M Brown at the Queensland Scout Centre in Brisbane on Sunday. Silver Arrowhead awards were also presented to Maryborough Showgrounds and Equestrian Centre manager Thea Griffin, former principal officer recreation services Denise Cox, Tanya Howard-Osborne of the Maryborough West Scout Group, and Marilyn and Wayne Peatey of the Baddow Scout Group. 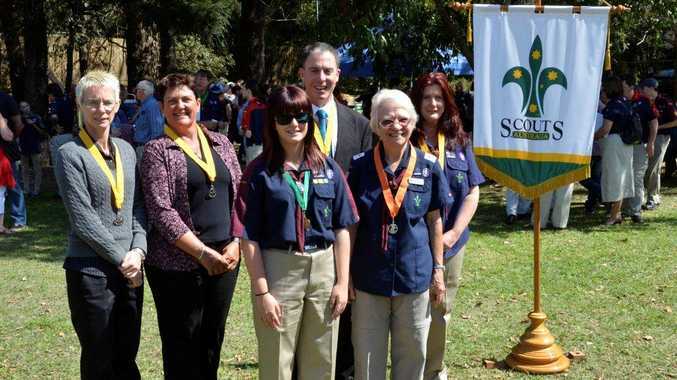 At the same ceremony, a Silver Koala Award was presented to Sandra Tomlison of the Bauple Scout Group and an Australian Scout Medallion was presented to Charlee Howard-Osborne of Maryborough West Scout Group.